Shock News! Why Isn’t the Arctic Ice Free? Today we move on to the second sentence in David Rose’s article “this time last week”. As you can see, the Mail article includes no references. Surely in this day and age an online article about such a controversial subject should at the very least include a few links? Hayley Dixon’s article for The Telegraph did at least manage to do that! I’ve asked David Rose via a number of different avenues where he got his information, and how he did his sums. I know he got at least one of the messages because he was browsing my profile on LinkedIn last week, but I have yet to receive any answer from him. [His] latest modelling studies indicate northern polar waters could be ice-free in summers within just 5-6 years. 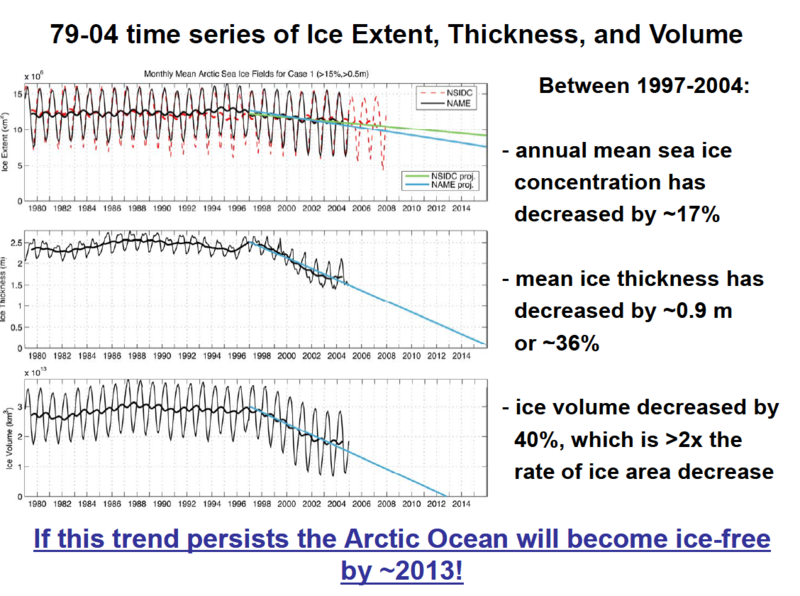 IF this trend persists the Arctic Ocean will become ice-free by AROUND 2013! If we project this trend ongoing for the last 10 – 15 years, we probably will reach zero in summer some time mid next decade. The evidence suggests that David Rose doesn’t research his sources properly, doesn’t understand English and doesn’t understand common mathematical symbols. Alternatively he understands all of that perfectly well, but chooses to misrepresent all of that to his loyal readership instead of educating them about the facts of the matter. Great detective work. You wonder what Rose is referring to when he says that the BBC said the arctic would be ice-free by 2013, and you google and find the BBC article saying the arctic would be ice-free by 2013. Then you make a logical error – surprising for someone with a computing background – in criticising Rose when your criticism, such as it is, applies to Amos. Rose’s statement about what the BBC said seems to be accurate. Thanks for your comment, and your kind words! The BBC reported that global warming would leave the Arctic ice-free in summer by 2013. Would you care to play “Spot the difference” with me? I “chose to omit” all sorts of stuff, because I prefer to keep things short but sweet here. Unlike David Rose I have provided links to my source material, to make life so much easier for commenters like you! I’d say you got owned by Paul! Id also say that you are guilty of the very charges you are levelling at David Rose! As you can see from my picture my temples are receding and I’m a bit grey around the edges. What does “owned” mean in this context? I was labouring under the misapprehension that I am a free man. Perhaps you could explain in greater detail precisely what I’m guilty of too. It’s easy to say things, but much harder to prove them! @ Paul: Your statement, that the BBC article by Amos said that the Arctic would be ice free by 2013, appears to be based on the goofy mistake of identifying the HEADLINE of the Amos article with the actual article CONTENTS. There is nothing in the BODY of the Amos article to support the claim made by Rose. Moreover, as for the headline itself, it isn’t even an unambiguous statement, since the verb is suppressed, in typical headline fashion. If one wishes to report on an article, reading no farther than the headline is not an option. Your criticism of Hunt’s blog entry is unjustified. Maybe you missed the bit I quoted in the 3rd paragraph of my comment. @ Paul: I presume you are referring to my remark about the need to read past the headline of an article. That was a reference to Rose, not you. @Paul – but even you can see that David Rose who is trying to present himself as a serious writer about the science here actually didnt bother to check with the scientist of which he base his article on. And neither did he choose to refer to where he got the information. How can a reader actually believe anything David Rose say when it looks like he pulled it out of a hat? A bit of research like Jim Hunt here does clearly shows that David Rose was quite likely just making headlines with cheap tricks. He might even have checked the real source but since what Maslowski said didnt quite fit his idea of a headline news story, he found it convenient to: A) Not refer to Maslowski directly – B) Hide behind something BBC said that someone else said… David Rose has no credibility and its clear that he is running an agenda with this story, and not really reporting on the science. Rose is not trying to present himself as a serious writer about the science is he? He’s a tabloid journalist.